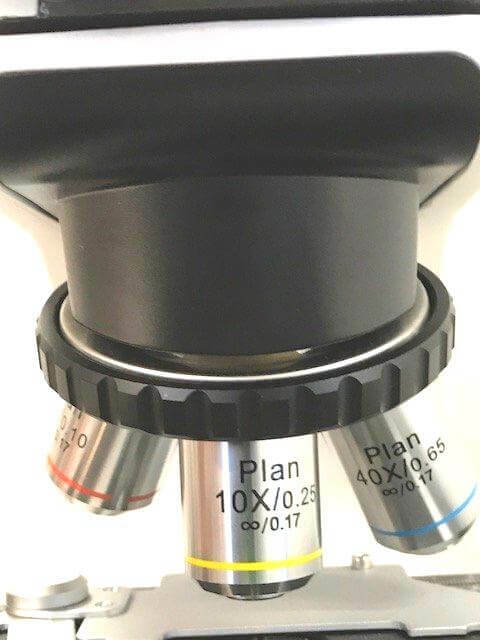 If you’re a frequent user demanding a high level of performance of your laboratory microscope, ‘Planar’ or ‘Plan’ Objective Lenses give you a clear image that’s in focus at the edges as well as in the centre. Microscopes work by deflecting the path of light rays to make objects look many times larger – up to a 1000 times larger – than life. In modern laboratory microscopes, controllable light is provided by the built-in tungsten filament, halogen or LED light source, focussed onto the sample through the substage condenser. Light passes through the sample or slide mounted on the microscope’s movable stage. Double-layer stages allow the operator to move the sample around in very small increments while vernier calibrated scales let the operator record the position of important findings and locate them again. Light passing through the sample enters the microscope tube at the objective lens. In the pioneer days of microscopes, the objective was a single convex lens resembling a highly polished bead of glass. A single lens will deflect light rays sufficient to effectively magnify the image, but also introduces a number of other unhelpful distortions or ‘aberrations’. The image created by the objective lens is further magnified by the eyepiece lenses and focussed onto the retina of the operator’s eye. 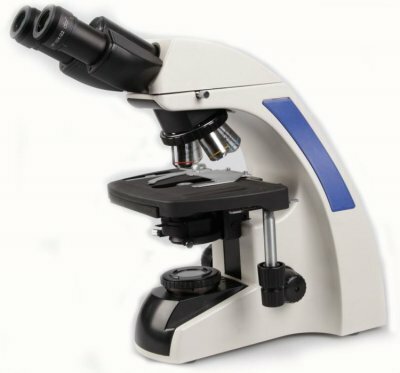 A binocular microscope or ‘stereo-microscope’ allows the operator to view the sample with both eyes. One of the most annoying and difficult to correct objective lens aberrations is the loss of ‘flat field’ or ‘planar image distortion’. Uncorrected, an objective lens will create a curved rather than flat image on the retina of the operator’s eye. This means that while the centre of a sample might be in sharp focus, the edges of the image will be fuzzy and blurred requiring the operator to continually refocus within each field of view in, for instance, a stained blood-smear slide. Constant refocusing can cause operator fatigue, eye strain and inefficient use of laboratory time and even introduce errors. Planar or Plan Objective Lenses adjust correctly the paths of light rays passing through them to create a flat image that’s in focus at the edges as well as in the centre, reducing eye-strain and operator fatigue. Vetlab Supplies’ Premiere 1600 and Premiere 2000 veterinary microscopes feature Infinity Plan Objective Lenses. The benefit of a Plan Objective is perhaps most noticeable when taking photo-micrographs using the trinocular photographic head. These professional quality microscopes also exploit the advances of Revolutionary Infinity Optics, holding the light rays from the objective parallel – as if focussed on infinity – to form a clearer, sharper image in the eye or in a digital camera.